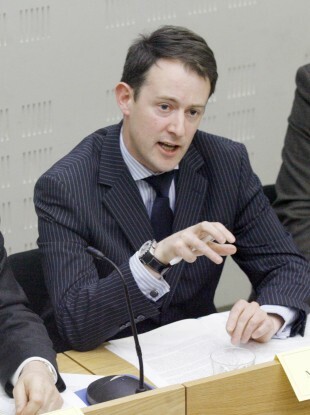 Junior minister Sean Sherlock had said he was not prepared to share a podium an event tomorrow with the organiser of the StopSOPAIreland.com petition. JUNIOR INNOVATION MINISTER Seán Sherlock has this evening agreed to attend a panel discussion including the organiser of a petition attacking his online copyright laws, after earlier saying he would not share a stage with him. Sherlock is due to attend a forum on digital rights being held at Dublin’s Science Gallery tomorrow, alongside Boards.ie founder Tom Murphy, Paul Durrant representing internet service providers, and solicitor Simon McGarr, who founded the StopSOPAIreland petition. Having this afternoon said he would not share a podium with McGarr – accusing him of “causing some reputational damage to this country by deliberately misinterpreting the [new legislation] as SOPA” – the minister this evening said he had had “a change of heart”. “If Simon accepts, then I’m very happy to have him on the panel,” Sherlock told TheJournal.ie this evening. “I think we need to move on on this debate and a good panel discussion does require the presence of somebody from the Stop SOPA Ireland campaign. I still reject their interpretation of the [legislation], but for the process of transparency and debate I realise that in order for everyone to have confidence in the process, it is vital that Simon and his colleagues would have their say. The minister’s earlier statement followed an article by McGarr published on Broadsheet.ie today, in which he said he had been told Sherlock would cancel his appearance at the forum, which was to discuss a controversial statutory instrument drafted by Sherlock earlier this year. That legislation – dubbed the ‘Irish SOPA’ by its opponents, who claim it could far-reaching consequences similar to proposed laws in the United States – had attracted over 80,000 signatures to the StopSOPAIreland petition before it was enacted on February 29. And the Minister didn’t want even one voice from that group to be heard. He said he had agreed to be dropped from the panel at the event in order to facilitate Sherlock’s attendance. Organiser Sean Nicholls had said on Twitter that McGarr had not been “uninvited” from the forum, and that he had been invited to participate in a question-and-answer session at the event, though not as a main panellist. Sherlock explained his earlier opposition to sharing a platform with McGarr by saying the now-aborted SOPA laws in the United States were “completely unrelated” to the statutory instrument signed in February. I reserved my right not to share a platform with any body who was acting solely in their own interests and not those of the wider online community who we meet and assist every day. The Labour junior minister said Ireland was doing more to attract investment from online companies than any other European country, and that “any person that started a campaign that deliberately misinterpreted that legislation should take responsibility for their actions in damaging this country’s reputation”. More details on the digital rights forum, which takes place at 1pm tomorrow, can be found here. Booking in advance was required and the event is now booked out. Email “Sherlock agrees to attend debate with organiser of anti-’SOPA’ petition”. Feedback on “Sherlock agrees to attend debate with organiser of anti-’SOPA’ petition”.